Join Robert Plante for coffee and a muffin outside Cravin’s Country Market & Deli at Dartmouth- Hitchcock Medical Center on a given weekday morning, and you’ll feel like you’re dining with a celebrity. Nearly every person who walks by knows him, and more than one stops for a hug, a quick chat, and to share words of love and admiration for Robert with a local reporter. 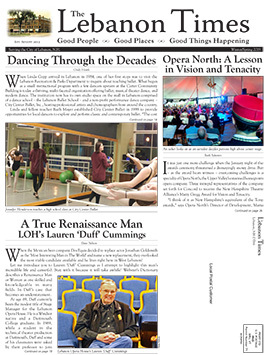 Clearly his presence in the Lebanon community has made a positive difference in many lives. 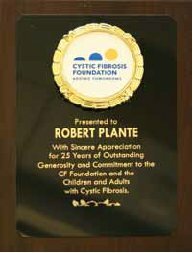 Robert’s crowning – and continuing – achievement is his work on behalf of the Cystic Fibrosis Foundation (CFF). 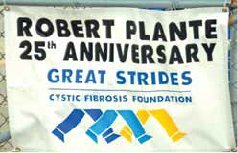 In September, Robert celebrated the silver anniversary of the Robert Plante Fall Foliage Walk, and his personal fundraising of more than $250,000 for CFF in the past 25 years. He has walked more than 7,500 miles to raise that money, despite his own struggles over the past decade with osteoarthritis. Nearly 50 community members participated in this year’s walk. 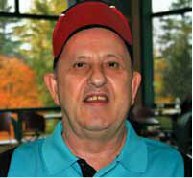 A quarter-century ago, Robert began walking to raise money for CFF first in honor and later in memory of his dear friend and fellow Lebanon resident Doug Jones, who had cystic fibrosis and passed away at age 43 in 1992. According to CFF, cystic fibrosis is an inherited chronic disease that affects the lungs and digestive system of about 30,000 children and adults in the United States. 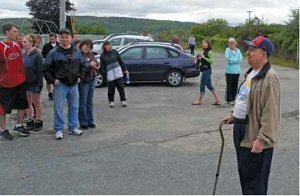 Robert’s efforts didn’t start as an organized community event; just a dedicated guy walking around the Upper Valley seeking donations for a cause near to his heart. Over the years, it developed into an annual four-mile foliage walk from Lebanon High School to downtown and back. While CFF provided some logistical support, the major credit goes to Robert and the team of supporters he has cultivated at DHMC and around the Upper Valley. For several years now, the walk has been sanctioned as an official CFF Great Strides event, and in 2014 it will be held for the first time in May in conjunction with other events nationwide. Next year’s event will be held at Storrs Pond in Hanover and include a 5K run along with the walk. Robert is happy to raise money for the vital research and care programs provided by CFF, whose mission is to find a cure for the disease. “We’ve come a long way with the research since I lost Doug Jones,” he said, adding that many children and adults with cystic fibrosis have inspired his efforts over the years. Robert proudly displays a September letter from CFF President and CEO Robert J. Beall sent in gratitude for Robert’s contributions to research and community awareness of cystic fibrosis. Judging by Robert’s genuine passion for the work he does to serve others, that is faith well placed. To learn more about the Cystic Fibrosis Foundation and Great Strides, including their events in Lebanon, visit cff.org.